An info stand will present the latest innovation, spinitsystems spinning and knitting technology. The OVJA 2.4 EM is a new machine designed especially for the mattress ticking market’s changing demands. It focusses on maximising output of standard mattress cover fabrics. The machine achieves this goal by combining a higher number of feeders (2.4 per inch) and a higher speed (up to 25 rpm with 38 ‘’). The machine is based on the tried and trusted OVJA 2.4 E. Although OVJA 2.4 EM focuses on maximising production, it still offers a wide range of mattress cover designs. 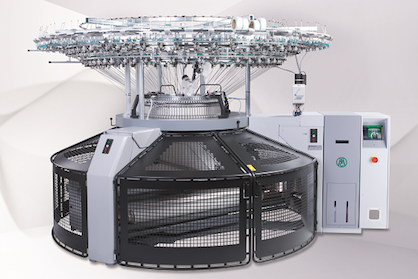 Thanks to its single needle selection, design changes can be done quickly. The result is a highly productive, easy-to-handle machine that promises to meet the requirements of Turkish Mayer & Cie. customers in respect of quality, productivity and profitability. Mayer & Cie. Relanit 3.2 HS (c) 2018 Mayer & Cie.
More News from Mayer & Cie. GmbH & Co.